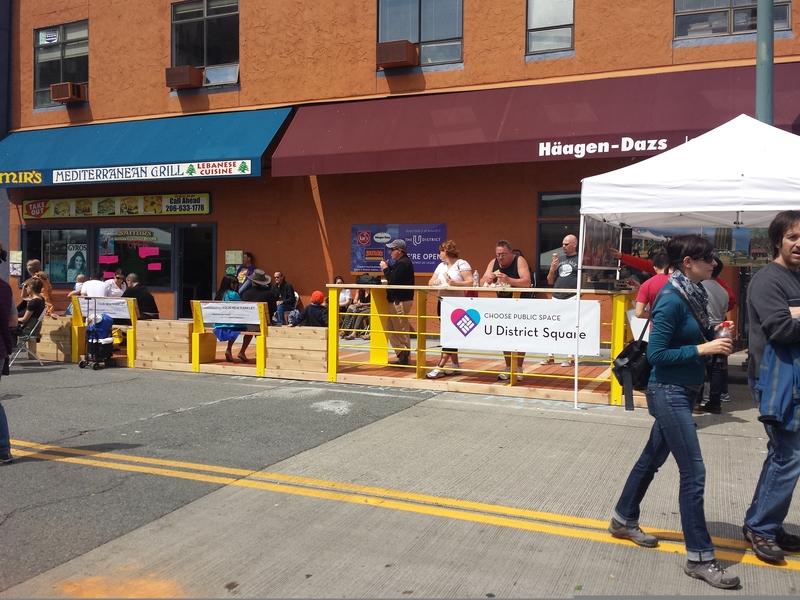 During the University District Street Fair last weekend the neighborhood welcomed its first official parklet. Located on 43rd Street at University Way, the parklet replaces two parking spaces and complements a Pronto bike share station outside of an ice cream shop and near several restaurants. It’s the latest example of the City of Seattle’s efforts to create open spaces in public right-of-way, and another is on the way just across the street. San Francisco has been credited with launching the parklet movement in the mid-2000s. Since then a number of other cities have adopted the “pavement to parks” idea as tactic for cheaply converting space for cars into space for people. Permanent parklets are typically built of wood and have varying types of seating and plantings, and often bicycle parking makes up a component. Temporary parklets, which the movement started with, are celebrated annually on the worldwide Park(ing) Day; they usually consist of grass sod with potted plants and mobile furniture, but can also take a variety of forms. 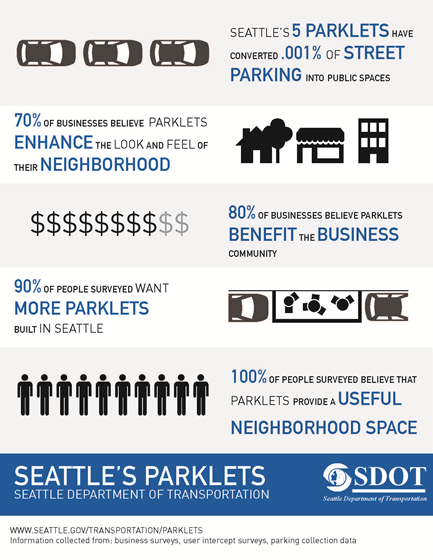 Seattle launched its pilot parklet program in 2013, and since then has seen only positive effects where they go in. They take up very little space while enhancing neighborhood appearance and benefiting businesses. There is widespread public support, and Seattleites want more of them. They also cost much less than acquiring land and building a formal public park. U District Square is the sponsor behind this particular parklet; the group of neighborhood residents is primarily advocating for public space in the growing neighborhood, and in particular envisions a central plaza integrated with the nearby light rail station set to open in 2021. The group funded this parklet through crowdfunding, raising $6,500 from 107 backers on Kickstarter (full disclosure: I’m a backer). It will be officially opened with a ceremony within the next few weeks. The design is 8 feet wide and 30 feet long. It is built with 2×6 wood decking and yellow steel, giving it a warm appearance. There is a counter wrapping around one end, presumably to have stools later, and the other end has three benches and planter boxes. It’s simple, accessible, and inviting; even after the streetfair ended, I’ve seen people casually using the space at all times of day. With the success of the pilot parklet program, the City has made the program permanent and started a pilot program for “streateries”. These are the same as parklets but are an extension on sponsoring restaurants, allowing them to provide table service right on the street. One of eight streateries planned this year will be right across from this parklet, outside of Flowers Bar and Restaurant. 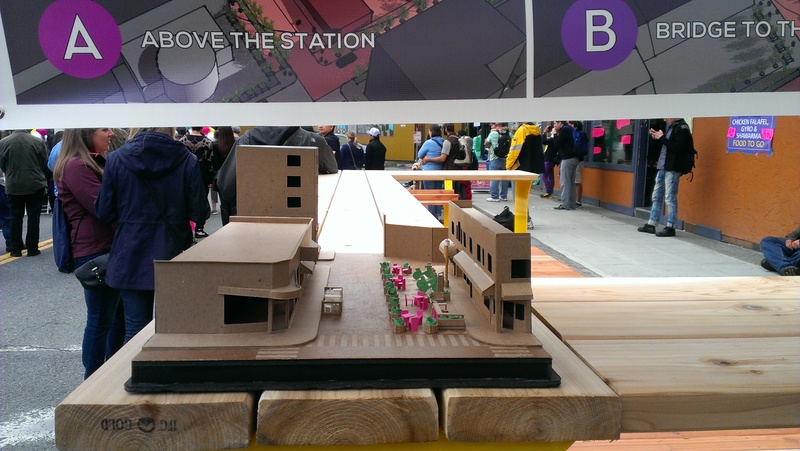 With two parklets, a bike share station, and the street’s long term closure, 43rd Street is becoming a unique public space within the bustling University District. And if that weren’t enough, it’s planned to be rebuilt as a green street with wider sidewalks and trees as the light rail station is completed. Stay tuned for future updates on all of the projects happening in this area. A model of 43rd Street by Cory Crocker was on display at the street fair. Photo by the author. This entry was posted in Biking, Parking, Parks, Policy, Public Space and tagged bike share, City of Seattle, Cory Crocker, design, features, First, materials, neighborhood, Park(ing) Day, parklet, pilot program, Prono, streaterie, street fair, streetfair, U District Square, U-District, university district. Bookmark the permalink.